Of course the correct answer, long term, is to develop the ability to sit comfortably for long periods in lotus. Which, however, starts with developing the ability to sit very uncomfortably for very short periods in lotus. And takes years. 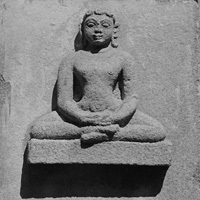 Padmasana, lotus position, the position in which the Buddha is normally shown sitting, is the iconic yoga position. There’s a good reason for that: once you can do it comfortably it is the most stable, supported sitting position for breathing exercises or meditation. (It has proven medical benefits too). Unfortunately a lot of western yoga students pursue it not for that reason, but because it’s seen as an “advanced”, cool-looking physical feat. In Indian eyes it isn’t at all: most Indians, who grew up sitting on the floor, can do it quite easily even if they aren’t otherwise particularly fit or flexible. But for many westerners who grow up sitting on chairs and consequently have very little mobility in their hips, it is difficult. It can take years to learn and a lot of people hurt their knees trying. Lotus seemed frighteningly far away to me when I started yoga. I had even tighter hips than most western men – I had been rock climbing for years, and friend of mine who has taught yoga to a lot of climbers says they tend to have very tight hip flexor muscles because of all the high-stepping manoeuvres that climbing involves. (If I had known that years earlier it would have helped me a lot). In addition, my whole right side from (at least) the ankle to the hip was much tighter than the left because I carried a serious knee injury for years. Seven years on, I can get into lotus quite comfortably once I’m warmed up. I rarely sit in it for longer than about five minutes, but at this stage that’s more about monkey mind than physical discomfort. I actually find easier yoga sitting positions, such as a fairly loose half-lotus, more comfortable now than sitting on chairs. If I can learn it, starting where I was seven years ago, then most people can. Along the way, though, I had two years of knee pain caused by going about it the wrong way, that should have been avoidable. There is excellent advice on how to learn lotus safely in this article in Yoga Journal by Roger Cole. This has the clearest explanation I’ve seen of the most common lotus-related knee problem that lots of western students have – the cause and how to avoid it – information that could have saved me lots of trial and error, some of it painful, if I had known it sooner. Short version: it’s all about outward rotation of the thigh in the hip socket. People who try to get into lotus when their hips aren’t flexible enough have to pull sideways on the foot to get it up onto the opposite thigh. The knee is not designed to bend sideways; trying to get it to do so puts excessive pressure on the cartilage on the inner edge of the joint and is painful and dangerous. A couple of other bits of safe-lotus advice that I’ve picked up over the years: British yoga teacher Godfrey Devereux showed me how to fully bend the leg, with the heel firmly against the upper thigh, while the thigh is still in a comfortable position. Then you can move the whole folded leg as a unit, pivoting at the hip, without any movement in the knee. Also important to keep the foot flexed. This technique ended my two year spell of knee problems and got me into lotus without pain for the first time. Corrolary that I learned myself: even though the main motion should come from the thigh and not from pulling on the foot, until you are very flexible you will still need to use your hands to guide and assist the foot up onto the opposite thigh. Do not pull on the foot. If you hold the foot it’s very likely that you will at some point pull too hard on it in the wrong direction, thus bending the knee sideways again. Much better instead to hold the shin just above the ankle – that way you can guide the heel in horizontally towards the hip/navel with much less danger of pulling upwards. Ahimsa. Ahimsa is the fundamental yoga principle of not doing unnecessary harm. As many yoga students discover the hard way, that includes not harming yourself in pursuit of the outward appearance of an “advanced” yoga practice. Of all Indian religious groups, Jains place the most emphasis on ahimsa – this thousand year old Jain yogi has chosen not to force himself into padmasana and is using an easier meditation position instead. Disclaimer: taking advice about how to do difficult yoga asanas from random strangers on the internet may not be the wisest thing you could possibly do. Michael Blowhard is right: “Patience and hard work … play discouragingly big roles”.